Though perhaps if you squint it might look like Big Ben? Well, maybe not! 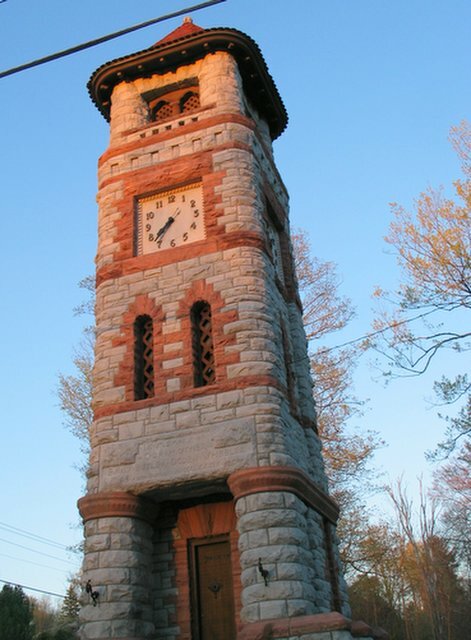 But our clock tower is the most striking and memorable landmark in Sharon - as in, "when you get into town, turn left at the clock tower..." It was built in 1884, and the clock works beautifully. Today is a theme day among the Daily Photo Blogs...many of us are posting pictures that look like, refer to or remind us of somewhere else. Check them out! And visit the real London here! Nice clock tower. I think you took the photo in the evening - the evening light brought out the color even better! Or, could it be a part of the Tower of London? Nice find! Love the clock tower - LOL - funny to have that in the town! I'm squinting but I think stopping by the pub and having a few beers would have been better advice. A common mistake has occured about what is Big Ben! Big Ben is actually the bell inside the tower. The tower, part of the Palace of Westminster in London, is known as the Clock Tower. 12 months on and Hyde DP is revisiting those that took part in the "other city" theme, with links to the other participants.